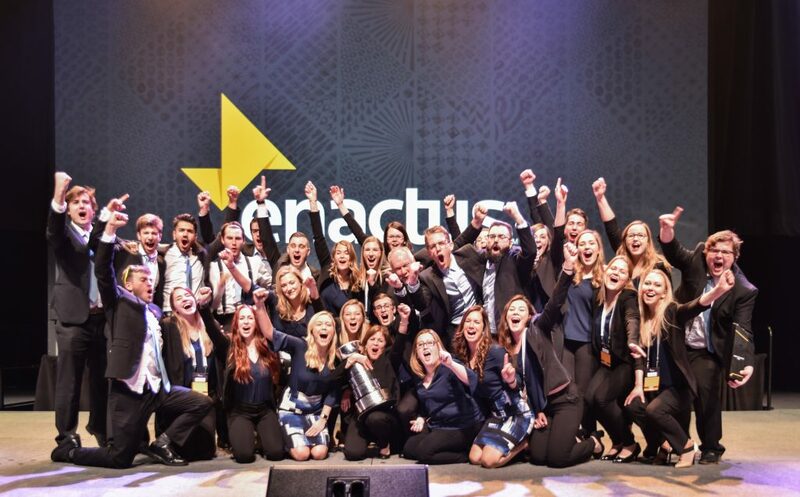 The 2016 Enactus World Cup Champions, from Memorial University of Newfoundland, will have the chance to defend their title in London this year, after being named the 2017 Enactus Canada National Champions. Over three rounds of competition, 61 teams proudly shared the positive impact they’ve had using entrepreneurial action with panels of executives serving as judges. Nearly 145 judges in the opening round narrowed the field to the semi-final teams; the 54 judges in those leagues had the difficult task of selecting the final four teams to present on the main stage to 57 of Canada’s top business leaders. In the end, Enactus MUN once again hoisted the cup, impressing judges with their Project Sucseed, a social enterprise that tackles fresh food accessibility in Canada’s far north. The team designed an inexpensive hydroponic unit to help individuals grow fresh food at home, and partnered with a local charity to provide at-risk youth with jobs manufacturing the units. The champion announcement was streamed live on Facebook – watch it below! But this was so much more than a competition. The three-day event, which took place in Vancouver for the first time, kicked off with an exciting opening ceremony, complete with a parade by province and the national anthem performed by a student. Chairman Ian Aitken gave the opening welcome, then attendees were treated to a keynote address from Donna Morton, Co-Founder and CEO of Change Finance, who shared her personal story as a lifelong serial social entrepreneur and how she developed a business that creates financial products that tackle social issues. With the spirit of collaboration in mind, attendees had numerous opportunities to come together and explore relevant topics and ideas, including the HSBC Women’s Leadership Forum, where they discussed mentorship and its role in the success of young professionals; the HR Innovation Forum that explored recruiting disruptors; and the Executive Forum, which included a student leader on the panel, that challenged participants to discuss innovation and how to foster it. And there was no shortage of celebration throughout the event, with numerous awards handed out to recognize both individual and team achievements. One of the largest was the Student Entrepreneur National Champion, presented to Amr Abdelgawad from the University of Waterloo, who received a $10,000 prize thanks to the John Dobson Foundation. Want more from the Enactus Canada National Exposition? There’s no shortage of media coverage and online posts for you to check out, such as this great television interview by one of the participating teams, this blog post by an Enactus Canada board member, and this detailed recap from the Enactus Canada team. #EnactusNationals #vancouver #Burnaby #bdc I was lucky enough to have Judged this week. Amazing talent we have in our young People!!! Judging day 2 of @Enactus_Canada nat’l competition. Some amazing presentations by inspired students. Future is in good hands w/ these kids!